Nilsan has earned the reputation of providing advanced medium and low pressure liquid chromatography systems. In collaboration with Novasep, we provide Prochrom®-Bio low pressure chromatography columns and systems, which offer highly reliable and robust solutions, designed for industrial processes and heavy duty operations. Prochrom®-Bio columns are the result of Novasep’s experience in developing, supplying and operating cGMP processes using preparative and process-scale high performance and low pressure liquid chromatography columns. Prochrom®-Bio columns’ unique design includes a hydraulically actuated piston and specially designed packing/unpacking valves to provide consistent and optimum performance. 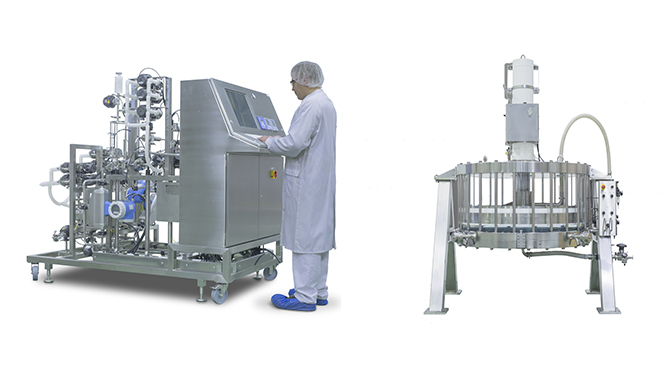 Novasep’s fully automated Prochrom® Hipersep-Bio LPLC systems are designed for process development, pilot-scale and production-scale downstream processing. Scalability is ensured using the same design from lab to large industrial units.